I got this recipe from my friend Nancy at least twenty-five years ago. Every family has a version of it in their recipe files, I’m sure. 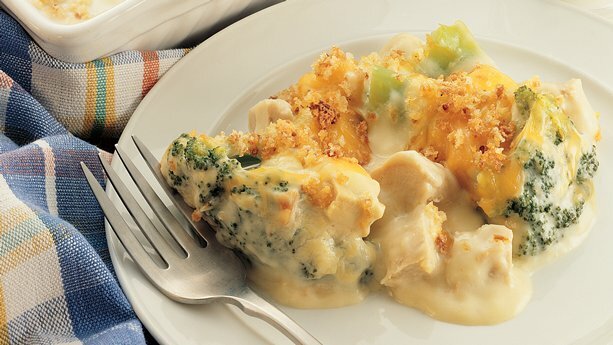 The ingredients aren’t fancy: chicken, broccoli, creamy soup mixtures, cheese. Add some curry and some personal tweaking and this one has been a favorite in my family for a long time. When someone is sick, or a crisis hits, it’s our go-to comfort food. 1 cup mayonnaise (just bite the bullet and use the real, full fat stuff. We’ve tried every iteration of mayonnaise in this, and nothing beats the real thing). A good hunk of cheddar cheese, grated. Reserve some. Place broccoli on the bottom of a 9×13 casserole dish. Spread chicken over the broccoli. Mix next ingredients, pour over the chicken. Top with reserved grated cheddar. Crush some crackers and sprinkle on top of it all. Bake about 30-40 minutes. Serve over rice. Add a green salad and bread or rolls, if you’re not on a low-carb regimen, and you’ve got dinner. SOUTHERN COMFORTS is a romance by my friend and Golden Heart® sister, Nan Dixon. We’ve been a busy bunch of GH finalists and many of the Dreamweavers have new books out. I’m thrilled for them all and happy to be able to read and review such excellent books. I’m so glad I loved SOUTHERN COMFORTS! Abby Fitzgerald is consumed with her family’s Savannah bed and breakfast. Grayson Smythe is in town from Boston. He’s working in Savannah for several months and needs a good, long-term living arrangement. Neither one is looking for a relationship or complication. Neither one expects to fall in love. I loved Abby’s commitment to her family and her business. 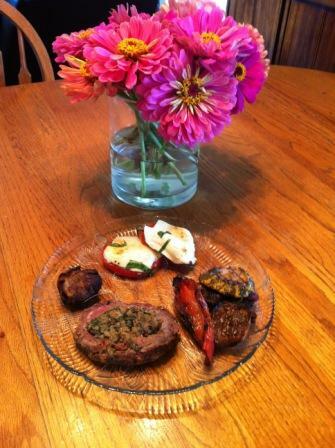 The recipes and food Abby prepares is enough to induce drooling. I get into ruts so easily and it amazed me how versatile and fresh Abby kept her menus. Grayson Smythe is wealthy and is used to people wanting to be his friend for what he (and/or his money) can do for them. Everyone except Abby. She’s determined to make Fitzgerald House a success without any help from anyone. But–this is a romance, after all–the day comes when Abby must accept help or let her dream evaporate. SOUTHERN COMFORTS is a fun read with some great recipes. I hope you enjoy it as much as I did. I’ve been reading Susan Mallery for a couple of years now and I really enjoy her. Both her lighter Fools Gold romances, and her longer women’s fiction. THE GIRLS OF MISCHIEF BAY is a women’s fiction title, set in the fictional town of Mischief Bay, in Southern California, not far from LA. It’s the story of three women, Pam, Shannon, and Nicole. 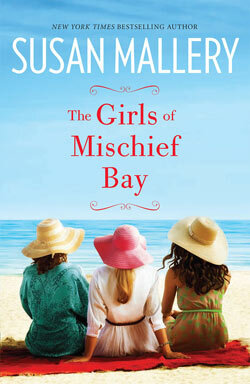 All are at different places in their lives but they share a love for Mischief Bay and each other. Pam is fifty, married to John for thirty years. She’s feeling a bit … not stale, she decided, but maybe dusty. Shannon is almost forty, single, successful in her career, but still looking for love. Nicole owns a Pilates studio, has a son, and is married to a man who came home to announce that he quit his job to write a screenplay. Oh, and surf. Which leaves Nicole as the sole support of the family. The book is well-written, with wit and humor woven throughout. There’s some heartbreak and some mending. Mallery is beginning a new series set in Mischief Bay and I look forward to the next installment. We’re not huge Quentin Taratino fans. We haven’t seen either volume of KILL BILL. I saw PULP FICTION and GET SHORTY years after their releases. But last week, DJANGO UNCHAINED was on and we had nothing better to do, so we watched it. The violence is quick and often and over the top, with heads exploding and blood geysering, and … well, let’s just say there’s a grisly sequence with dogs and a runaway slave. Yet there is a code for the violence. The final half hour of the movie is a blood bath, but the good guys prevail. Unlike real life, in the movies, we can fashion the ending we want. Django is a captured slave at the beginning of the movie. 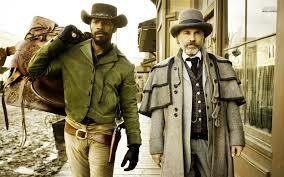 Dr. King Schulz “buys” Django to help him identify some outlaws. Before you can say “Slaves on horses,” the pair are a team of bounty hunters, making money and killing bad guys across the west and south. Until they meet up with Calvin Candie, an evil plantation owner in Mississippi. The ending is a foregone conclusion, but no less fun for the ride. Just feel free to cover your eyes when the hounds bay. I blogged here about my cousin Lori’s Lemon Artichoke Pasta recipe. I don’t know if it was really her “signature dish” but in my mind, it is. Stud Muffin’s is his Stuffed Rolled Flank Steak. It is not for the faint of heart. He has lots of steps and he won’t compromise on any of them. The day before, place flank steak on a hard surface and pound both sides until the steak grows about twice its size. Place Lawry’s Marinade (following package instructions) inside a large plastic bag with the steak and place in the refrigerator. The next day: Thaw spinach and squeeze out extra water and set aside. Chop shallots and sauté in a skillet with mushrooms and olive oil. Drain and set aside. In a large bowl combine spinach, shallots, mushrooms, breadcrumbs, and Parmesan cheese. Using both hands, work it through well. Place mixture on a greased (sprayed) cookie sheet and bake in oven at 350 degrees for 15 minutes. Take out flank steak and place on plastic wrap over cutting board; it will be messy. Place spinach mixture onto the flank steak and roll up. Fasten meat together with bamboo skewers. Fold ends up and hold in place with skewers. Prepare the Schilling’s marinade and baste the flank steak and place it on a hot grill. Continue to baste during the 35 to 40 minute cooking time. Take off and let stand for 5 minutes. Slice it into ½ inch thick portions and serve. A dear friend says this book changed her life so I picked it up and put it on the top of Mt. TBR. I finished it last week. 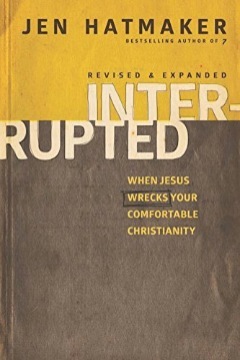 Interrupted follows Jen’s messy journey through life and church and into living on mission. Snatching Jen from the grip of her consumer life, God began asking her questions like, “What is really the point of My Church? What have I really asked of you?” She was far too busy doing church than being church, even as a pastor’s wife, an author of five Christian books, and a committed believer. She discovered she had missed the point. This is the first book by Jen that I’ve read, although I did watch a few episodes of the HGTV series following their family’s home remodel. I’ve had many of the same feelings Jen describes about doing church instead of being church. It’s a concept foreign to many of us in the middle classes, in suburbia, in complacency. Jen writes with honesty and the book also includes a few chapters written by her husband to give his perspective of their journey from a large contemporary church to a new church start-up in a more humble part of Austin, Texas. I hope I’m as open as Jen to the possibility of change and being called to something uncomfortable. Frankly, I’ve been part of a new church start-up and it was exhausting and demanding and I never found it even the tiniest bit greatly rewarding. I know that experience has made me wary of making any changes in my Christian life. But I hope if God calls, I would be obedient. Because otherwise, what’s the point of calling myself a Christian? It would just be a label, not a lifestyle. This series seems to divide people. They either love it or hate it. I’m in Camp Love It. I reviewed the first couple of Hunger Games books here. Last week I finally made it to the theater to see the first part of Mockingjay. I’m glad I procrastinated a bit so that the wait for Part 2 won’t be quite as long. They unflinchingly show what is possible in America’s future. The stories are just plain good. They adhere pretty closely to the books. Katniss is a real character. She’s not perfect. She’s conflicted. Jennifer Lawrence is great in the role. The setting is exactly as described in the books and how I imagined it. It ended at exactly the right place to build anticipation for the next movie. Have you seen any of the movies? Read any books? What do you think about them?